Ethnology pertains to the research of the traditional folk culture within the framework of the system of sciences. Ethnology is oriented on the study of the history of culture, human civilisation and ethnological relationships in the past and present. The beginnings of this science reach back to the late 1700s, and by the 1830s it had become a special scientific discipline. It is the oldest scientific field of this orientation, from which cultural anthropology (America) and social anthropology (Western Europe) later separated. Ethnology is commonly defined in relation to ethnography, which is defined as the collecting and description of cultural and social phenomena itself, while ethnology is defined as their theoretical interpretation. Ethnography is the scientific discipline which studies the genesis and phases of the development of material (forms of employment, housing, food, clothes) and socio-normative culture (social life, customs, faith, healing). Folkloristics is the scientific discipline of studying the development, conditions and ways of existence of folklore, its creators, content and formal aspects of folklore and folklorised creation. It is divided into verbal, musical and dance folkloristics. It absorbed methods of related sciences of art and from the field of ethnology. However the orientation and definition of folkloristics is not unified in individual countries due to the different content understanding of the term of folklore itself. Music folkloristics is the scientific discipline of studying European folk music in all its forms and shapes: song tradition, instrumental music, musical instruments, music rites and all syncretic forms of folk tradition in which music plays a significant role. It relates to collection, archive and museum source study, cataloguing of collections, musical, poetical, sociological and psychological analysis, classification of musical manifestations and their comparison, source-editing work, synthesis, music-style analysis, acoustic and audio-visual research, etc. The impulse for establishing music folkloristics was constituted by the national awakening movements at the end of the 18th century, which began to discover artistic values in traditional folk culture for the purpose of their integration in national art. Significant figures such as Kollár, Šafárik, Štúr and others are related to Slovak life and history. The significant development of music folkloristics occurred after World War II, in eastern and central Europe, the USA and other states of the world, in particular, where a wide basis of national and international music-folkloristic research was established. In Slovakia, the Institute of Musicology of the Slovak Academy of Sciences and the Institute of Ethnology Slovak Academy of Sciences deal with music folkloristics. The research of European folk music is implemented by regional studies focused on individual national, ethnic, cultural-regional, local and individual or family folklore traditions. Comparative music folkloristics deals with the searching for common signs, conformities and differences within the framework of a wider discipline, i.e. ethnomusicology. Ethnomusicology constitutes a part of musicology which was originated through synthesis of comparative musicology and music folkloristics and is under the strong influence of ethnography, social anthropology and cultural anthropology. It studies traditional folk music and music manifestations. Its main task is documenting in form of sound recordings or score transcriptions of all forms of music cultures which came down predominantly orally and through life music-interpretation practice. Ethnoorganology studies traditional musical instruments and instrumental music. Leading personalities of Slovak music folkloristics and ethnomusicology include Jozef Kresanek, Oskar Elschek, Alica Elschekova, Ladislav Burlas, Ondrej Demo, Alexander Mozi, Jana Kovacova, Bernard Garaj, Sona Burlasova, Elena Krekovicova, Hana Urbancova, Alzbeta Lukacova, Jana Ambrozova, Peter Obuch and others. Folk music Instruments (Visiting Arts) Ethnochoreology (dance folkloristics) is a specialised choreology discipline which deals with traditional folk dance, deportment, rhythmic and dance games. As a science it operates in symbiosis with ethnomusicology. It constitutes the collecting, documenting, analysing, systemising and multilaterally interpreting of traditional folk dance. 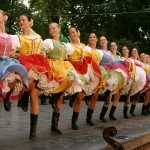 It focuses not only on the means of expression and the dance forms, but also on the way of existence and the forms in which dance and dance manifestations in the life of the examined communities is passed down; it also studies the issues of folklorism – the other existence of folklore (the folklore movement – ensembles, collectives, etc). It emerged as a science in Slovakia by the end of the 1940s in connection with the establishing of the folklore collectives (according to the model of the Soviet ensembles – the Alexandrov ensemble, the Mojsejev ensemble, etc.). The following scientists studied dance: Cyril Zalesak, Melania Nemcova, Elena Medvecka (children’s folklore in particular), Juraj Kubanka, Stefan Nosal (in connection with the work of the ensembles SĽUK and Lúčnica), Andras Takacz, Jozef Lehocky and others. The following ethnochoreologists worked within the framework of the Institute of Musicology of the Slovak Academy of Sciences: Kliment Ondrejka and Stanislav Duzek. The younger generation of ethnochoreologists, obtaining a Doctorate degree in the Department of Musicology of the Slovak Academy of Sciences, is represented by Dana Klucarova and Barbora Morongova. The study of ethnochoreology, including doctoral studies (graduate Katarina Babcakova) is currently covered by the Department of Ethnology and Ethnomusicology of the Constantine the Philosopher University in Nitra. This study field is led by Agata Krausova.